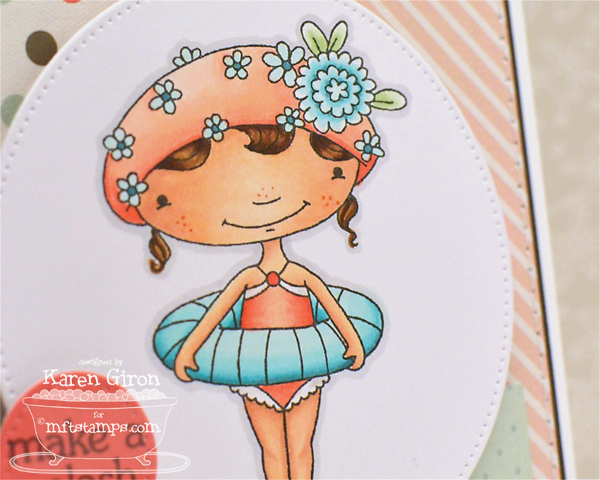 Today I'm showing off this adorable new Doodle Garden Take the Plunge stamp set. I stamped her in Memento Tuxedo Black Ink on X-Press It Blending Card Stock and then colored her with Copic Markers. The image is cut out using a Pierced Circle STAX Die-namics (LOVE!!) and then I cut out two more little circles to add the sentiment and accent. The sentiment is stamped in Black Licorice Ink on Sweet Day papers from Echo Park. The layout is The Sweet Stop's SSS217. I also added some sweet little freckles to her cheeks and nose with an E13 Copic. I don't know why I don't do that more often - so cute!! I stamped another sentiment inside the card on Sweet Tooth Card Stock and added more lovely zigzag stitching. Adorable Karen! Lovin' the little freckles you gave her! This little girl is very popular among the designers. She's really cute and the way you colored her was very charming. She is a beauty. I love the blue tones and the great patterned paper. Such lovely stitching details. I do like the pierced circle....she is a cute little lady.Great card. Oh, Karen!!!! She is absolutely precious...SOOOOO sweet...SOOOOO beautifully coloured!!! I adore the soft pastel colour pallet you used and her little freckles are too cute for words! LOVE her to bits! I love the colors you used here! Amazing! So, so cute! I love the pierced circles in the smaller sizes, and how you stamped the sentiment on a colored circle. Great card!! wonderful colors! I decided the girl needs a name, Daisy Doodles! Wonderful coloring! love the freckles on your Doodle girl. Love the colors you used to color her in. Beautiful card. Adorable card! Love the coloring on the main image. I will be ordering those pierced circle dies! Love the little freckles you gave her. Very cute card. Great coloring and love the sewing. Love that pierced circle stax! Genius! Totally adorable, Karen! Fabulous coloring! This card certainly made me smile...love the Peachy feel of it. Great coloring. Very pretty. Love the sweet image and your coloring. What a happy card. You are a talented colorist. So very pretty and beautifully colored!! she is adorable and I love the colors you used. Love her freckles! This is darling! Awwww...so cute! LOVE the soft sweet colors you chose!! And those pierced circles are to DIE for!!! Those are a must have!! Your image is colored so beautifully on your gorgeous card. LOVING the freckles! I never would've thought of that! The colors you chose are wonderful! Okay, this is the cutest colored Doodle Garden yet. I love how you shaded her legs.....Actually the whole image is stunning. I love the whole card. She's so sweet! What an adorable card! Great colouring honey! Love the softness of this one!